All About Slots is a leading online casino guide catering to players interested in playing slots at online casinos. 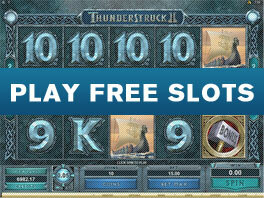 Our site is geared towards players looking to play slots games at top rated casino sites in particular. With many online casinos to choose from and play often it's difficult to choose where to play which is one of the primary reasons we built this site. To narrow the focus more we've included online casinos that we feel offer the best slots gaming experience. Furthermore we've chosen to only list online casinos we've deemed as being trusted, reputable and reliable casinos to play at. We've played at all of the casinos listed here at one point or another and have had overall good experiences with each. Circumstances regarding play at online casinos vary from user to user so we cannot say with 100% certainty that your experience will be the same good experience we've had. We're merely saying that the likelihood of having a bad experience is not as high as it would be if you were to play at other casinos that have not been approved by us here at All About Slots. We also want to note that although our site is geared towards slots players that all of the online casinos we feature on our site boast an assortment of games beyond slots games. These include a variety of table games including blackjack, baccarat, craps, roulette, pai-gow poker and more along with many video poker variants and other games found traditionally in land based casinos. In many cases including that of Microgaming and Playtech casinos you'll have the opportunity to play a large selection of games in excess of several hundred games. If you'd like to get started and browse though some of the online casinos we've featured here on our site we suggest reading some of the reviews of casinos we've made available here.